All the prophets of the world, including those in the ancient Americas, have testified "more or less" (Mosiah 13:33; Jacob 4:5) concerning the coming and atonement of Jesus Christ. In Alma 32 the prophet Alma tells how to plant and nourish the seed of true faith. In verses 22 and 23 he discloses what the seed is that people should plant in their hearts and that will sprout and grow into a tree of everlasting life. That seed is a declaration of faith. It has seven parts, as this chart shows. 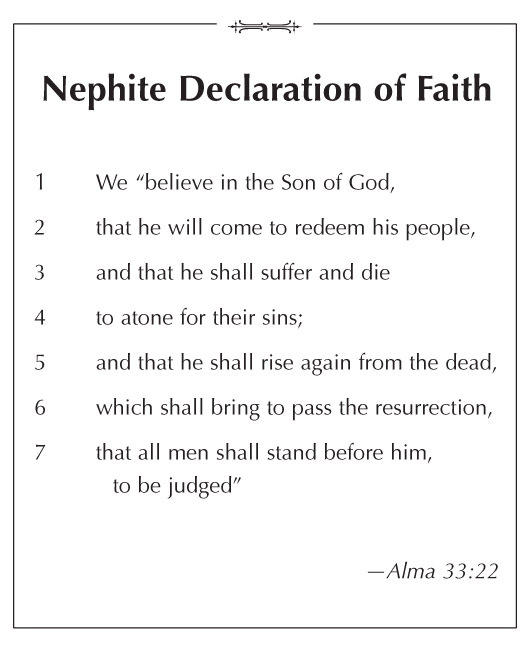 One may well imagine that Alma and his followers could have personally recited this declaration in explaining their faith, in much the same way as members of the church today use the Articles of Faith in stating the fundamental elements of their faith.